Barn Swallows from Crossed Wing Collection is stitched on a hand-dyed fabric available from Crossed Wing Collection with a stitch count of 227w x 216h using DMC or Anchor floss. 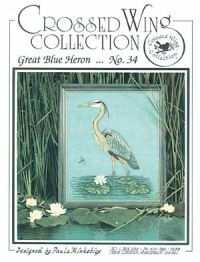 The Great Blue Heron from Crossed Wing Collection is stitched on 28ct Blue Wing or 14ct fabric of your choice with a stitch count of 288w x 337h using DMC/Anchor floss and Kreinik Blending filament. Pretty & Pink from Crossed Wing Collection is stitched on 28 count hand-painted Lily Pond from Crossed Wing Collection. The stitch count is 121w x 122h and uses DMC or Anchor floss. Sandhills from Crossed Wing Collection is stitched on 14 count or 28 count Whispering Pine from Crossed Wing Collection with a stitch count of 304w x 217h. DMC or Anchor floss is used. 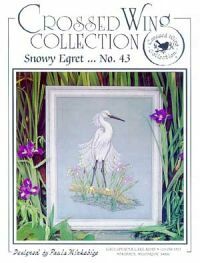 Snowy Egret from Crossed Wing Collection is stitched on 28 count Blue Wing with a stitch count of 206w x 267h and uses DMC or Anchor floss.